Excuse the pun, I just can’t help it. Container herb gardening provides a pleasant addition to your garden design and cooking experience. Learn how to grow herbs successfully in containers. These delightful plants are most useful and versatile. Choose your favorite herbs and plant them in a beautiful container. No matter where you live, there is always place for a container of some sort. Right! Be Creative in your Container Herb Gardening! Choose herbs for their beauty and use. Get some contrasting colors, different textures and sizes. Make it interesting. Remember, each container is a mini garden design on its own! Establish the plant needs, before you place any type of herb into a container. What type of herb is it? Is it an annual, perennial, shrub or a tree? Once you have identified the plant needs, you can fulfil their requirements. Herbs require a lot of sunshine. They require a position where the air can circulate around the plant. Some herbs like acid soil, other sandy soil. Most herbs like rich composted soil. They need to be protected from draughts. 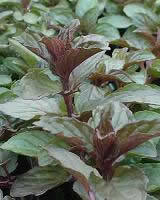 Herbs also need well drained soil otherwise they will become water logged. If they don’t have sun, they become leggy. Do you have the right kind of soil? Have you taken all the necessary steps to ensure a happy and healthy plant? You have identified what kind of container and herbs you want to grow. Now look at their unique needs. Take time to locate the perfect spot for them. Look at your surroundings. Are there any large trees or walls that could cause shade problems? Look at your container. Does it suit your style and link with your garden? Maybe you should take a peek at the container garden design principles. Just to make sure you have everything covered to ensure a happy healthy herb garden. Our container gardening tips page describes the proper planting techniques for container plants. Apply these techniques for your container herb gardening. There are many kinds of herbs that can be used for container herb gardening. Here are some of my favourites. Parsley is an Annual / Biennial. Sow parsley in spring. Follow the directions on the packet. Alternatively use seedlings. Place your container in a sunny position (in rich soil). Hot parsley tea is a diuretic. It also helps rheumatism sufferers. It aids in removing excess fluid from body tissue. A sprig of parsley chewed everyday is said to keep you in good health. It also keeps your breath fresh. 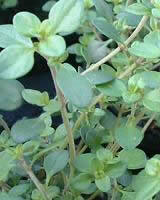 Thyme is an evergreen shrub. It smells good when the leaves are bruised, and it can be used as a culinary herb. Many designers use it as an edging plant because it smells good when lawnmowers bruise the leaves. Plant thyme in early autumn or mid spring. Replace the shrub every 3 years. Thyme has medicinal uses, mouthwashes are made from it. It has been used as an antiseptic. A cup of thyme tea at night sweetened with honey will promote sleep. As an ointment, thyme is good for spots and pimples. Mint is a perennial. All mints need rich moist soil. They make good container plants. Plant thyme in mid spring. Mints are excellent digestives. You can ease heartburn and colic by chewing a mint leaf. They also have anti-flatulent, anti-spasmodic and antiseptic properties. There are many other herbs that you can choose for your container herb gardening. I’ve just mentioned a few. It is very rewarding to grow them, and to use them out of your garden. Containers outside your kitchen door are very convenient.